Mysteries and thrillers for the reader who wants to be safely immersed in the darkness of criminal psychosis while following investigative reporters, detectives and private crusaders who find justice and peace for survivors and society at large. Strange, unsolved disappearances and government conspiracies haunt this first novel written by award-winning investigative reporter Jeremy Finley. When Lynn Roseworth's grandson, William, goes missing, Lynn is faced with the prospect that a crazy zealot has targeted her family, especially because of her career-minded husband, who is a prominent senator. Wanting to do all she can to help rescue efforts, but fearful that her past will imperil her family, Lynn has to carefully navigate difficult circumstances and complicated relationships. Lynn is a smart, curious and strong protagonist, and her research skills help her discover important clues and previously overlooked patterns and connections. Fans of thrillers and the supernatural will enjoy this book. Parenting is a big job, fraught with anxiety and fear. But what happens when your child is a psychopath? Seven-year old Hanna has never spoken, which has her mother, Suzanne, worried. While Hanna may be quiet, she’s fiercely intelligent and just plain fierce. Suzanne is convinced Hanna is terrorizing her. But all anyone else sees is a cute little girl, leaving Suzanne alone and afraid. Baby Teeth is told in alternating points of view, so the reader really gets into the mind of Hanna – scary! 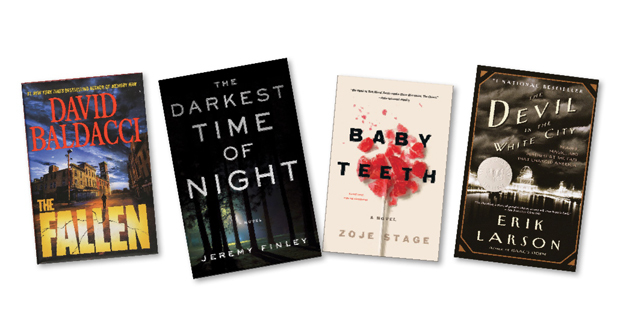 Baby Teeth is a truly chilling, psychological thriller and a must-read! “I catch killers. It’s really the only thing I’m good at.” Amos Decker, a detective with a near perfect memory and a need to pursue justice for those impacted by murder, and his partner, Alex Jamison, return in this fourth entry in The Memory Man series. While visiting Jamison’s sister in Baronsville, Pennsylvania, a town that has fallen on hard times and in the depths of an opioid crisis, Amos happens on a double murder. Decker and Jamison quickly learn that these are not the first murders to take place in the town. The question is… will they be the last? With machine gun quick chapters and pacing, strong character development and enough twists and turns to keep you guessing, Baldacci once again delivers a very satisfying mystery. “Murder, Magic and Madness at the Fair that Changed America” is the subtitle of this fascinating read, and it does not disappoint. This non-fiction title actually tells two stories in one. The first is the story of the 1893 World’s Fair in Chicago, which more than 27 million people attended from around the world. It’s where Juicy Fruit Gum was first tasted, the Ferris Wheel terrified its first passengers and where Pabst won its blue ribbon. The second is the dark threat that lurked under the glittering displays and dazzling new innovations. H. H. Holmes is one of the most infamous and fascinating American serial killers. His terrifying “murder castle” was built just in time to house many of the tourists visiting Chicago for the fair. This “World’s Fair Hotel” was the last stop for some young women and came complete with trap doors, gas chambers, a crematorium and dimly-lit hallways that went nowhere. Larson seamlessly weaves these two stories into an amazing tale that fascinates and horrifies. True crime fans will find a genuinely chilling delight in I’ll Be Gone in the Dark, which follows the campaign of terror carried out by the recently apprehended Golden State Killer. McNamara, who passed away unexpectedly before the book’s completion, writes with great care about those targeted by the GSK, providing her audience with the sort of fully fleshed out portraits of victims and their families usually lacking in true crime accounts. McNamara’s untimely death lends a particular poignancy to the book – her passionate and tireless detective work undoubtedly contributed to the killer’s capture, and she never lived to see him identified. Pick up a copy of this New York Times bestseller for a truly compelling and terrifying read.